Tonight’s result was solely a product of the effectiveness (or lack thereof) of the starting pitchers. As soon as AJ Burnett was removed from the game, the slumping Phillies resumed having unproductive at bats, while the Yankees lineup came alive once Jamie Moyer exited the mound. Unfortunately for the Yankees, Moyer dazzled the Yankees for eight innings, while Burnett’s three-plus were a complete disaster. Jamie Moyer puts every ounce of effort into one of his pitches (Photo: AP). The maddening inconsistency of AJ Burnett was evident once again as the erratic Yankees righty allowed 11 base runners and six runs in 3 1/3 innings. Burnett has now lost his last three starts while pitching to an ERA of 9.00. Not only did Burnett walk four batters in his brief outing, but he constantly pitched from behind, barely throwing half of his pitches for strikes. After setting up a four run second inning with his wildness, Burnett then surrendered back-to-back home runs to Ryan Howard and Jayson Werth in the third. Finally, after failing to cover first base on what would have been an easy ground out, Girardi mercifully ended Burnett’s evening. Like or not, AJ Burnett is never going to be consistent. More than most starting pitchers, Burnett runs hot and cold, and right now he is in the midst of another frigid stretch. More frustrating, however, is Burnett’s tendency to throw in the towel when faced with adversity. His failure to cover first base in the fourth inning was further evidence of Burnett’s lack of concentration, and it earned him a well deserved chorus of boos when he walked off the field. Meanwhile, the Yankees were flailing away at Jamie Moyer’s slow and slower approach. Moyer’s arsenal ranged from a 69mph curve to an 81 mph sinker, yet somehow the Yankee batters seemed to behind on just about every pitch. The Yankees did manage solo home runs by Jorge Posada and Robinson Cano, but otherwise could not sustain any pressure against the Phillies’ aged lefty. If there was any doubt about whether Burnett pitched poorly or the dormant Phillies lineup had finally been revived, the combination of Boone Logan and Chad Gaudin combined to pitch 5 2/3 perfect innings (not including one intentional walk). Even the most optimistic Yankee fan would have to concede that the bullpen’s sterling effort was the result of a still struggling Phillies’ lineup, which makes Burnett’s bad start all the more alarming. The Phillies also came away with some cause for alarm as Brad Lidge was once again very shaky in trying to close out a 6-2 lead. As they seem to always do, the Yankees rallied to bring the tying run to the plate in the ninth, but the comeback fizzled when Posada swung over a slider in the dirt (one pitch after taking a hanger right over the plate). Even though he was able to finish out the game, the Phillies can’t be too confident in Lidge’s ability to close. Although maddening, Burnett’s implosion really isn’t a long-term concern. However, the Yankees do need to be a little concerned about Arod, whose base running in the ninth didn’t suggest a fully healthy player. Even though the offense has compensated for his absence over the past few games, the Yankees need Arod in the middle of their lineup. Burnett will eventually hit a hot stretch, but a lineup without Arod would be a major blow. 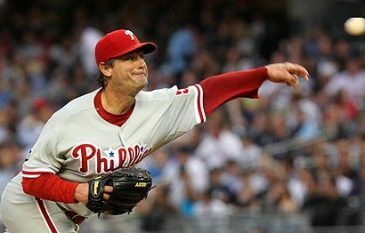 Jamie Moyer (47 years 210 days) surpassed Phil Niekro (47 years 122 days) as the oldest pitcher to beat the Yankees. Ryan Howard’s and Jayson Werth’s home runs represented the first time the Phillies went back-to-back all season.